Does anyone have a 256 piston and rod lying around? I could really use rod length measurements (hole center to hole center if possible) and on the piston a wrist pin hole to top edge of piston. 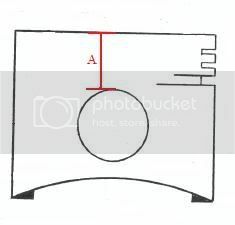 I have a attached an image od the two measurements i need. Thanks a whole lot for those measurements. 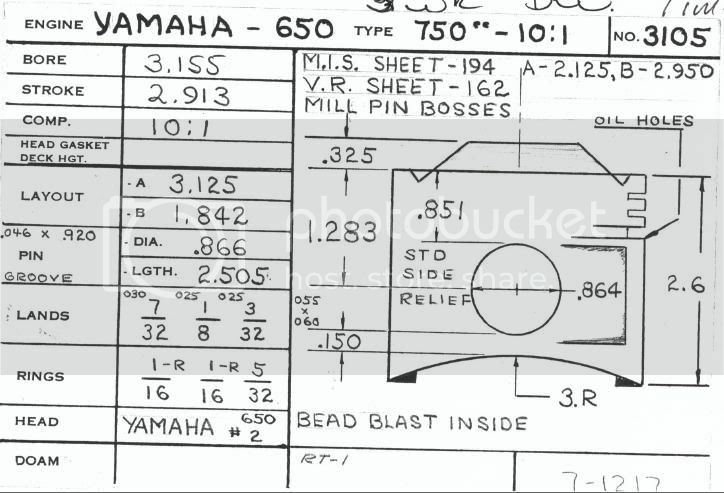 I am ordering a custom piston from Venolia and I think the pin placement is set for a 256 engine. I know the pin hole size is for sure. Here is the piston drawing. Despecial, you've put down the big end as 26mm pin. Edit: Just looked at Mikes, bearings suit all motors, so rod big end is 34mm. OK here is the whole story with this question. I have a '79 XS650 engine. I got a head ported by 650performance.com. The porting was designed by Harry Lillie and the Venolia pistons were designed by him too to work specifically with his head porting. I am going to get a set of Carillo rods made for my application to ensure max rod strength. So looking at the piston design I realized they are set up for 22mm pins which come on the 256 engines. According to Craig Weeks the 256 rod and piston were preferred by top tuners for their dwell time at TDC. I am hoping to get the Venolia pistons and then use 256 sized rods and have it all work together with my rephased 447 crank. Any help or suggestions is greatly appreciated.